While our mission is social, our innovative solutions are made possible by pushing the boundaries of science and technology. We rely on extensive scientific investigation to help us ensure that our products are truly going to make a difference for people around the world. The All-Terrain Knee utilizes a proprietary stance-phase control mechanism (the AutoLock) and swing-phase control mechanism (Variable Cadence Controller or VCC). The mechanisms comprise a 4-linkage (4 bar) kinematic chain. 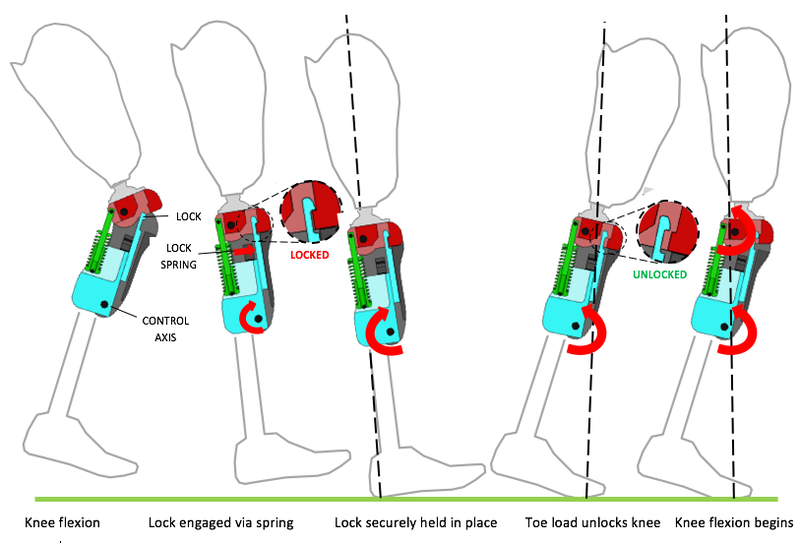 The AutoLock technology is based on a knee lock that is automatically engaged in late-swing-phase for extra safety. The knee remains securely locked until mid-to-late stance-phase when it is disengaged for an effortless swing‐phase initiation. The Variable Cadence Controller (VCC) utilizes a variable friction system with an optimized extension assist spring for efficient gait at multiple walking speeds. The 4-bar kinematic arrangement of the All-Terrain Knee mechanism results in polycentric kinematics and swing-phase foot-clearance comparable to 4 and 6 bar polycentric knee mechanisms.